What you are going to like the most about the King Colossus slot game is that during the free spins bonus game one of the highest paying reel symbols transforms itself into a huge sized reel symbol, and will cover a 3 x3 type of grid on the middle three reels. However, they are also some high valued winning payouts that can be achieved on this slot via the base game, and being a slot designed by Quickspin you are going to be able to access it for free or for real money and also you can play it online or on a mobile device too. The King Colossus slot from Quickspin has been designed as a multi-denomination slot, so a very wide range of different staking options will be on offer to you if you do decide to give it a whirl! 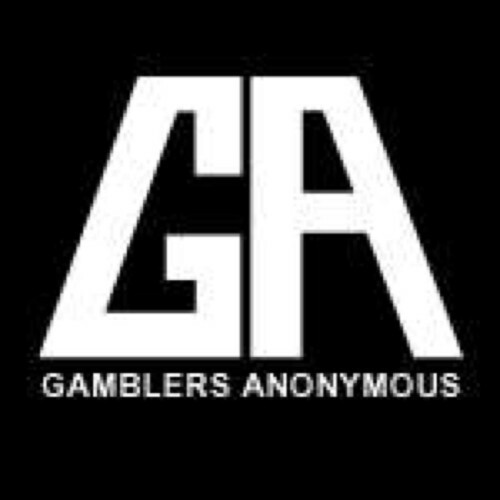 There is however 40 paylines spread over its reels and being a fixed payline slot you cannot adjust the number of them in play per spin. The coin value settings however can be adjusted so a minimum bet spin costs just 0.40, and you can increase the coin values upwards in value with the max bet spin being a huge 120.00 when setting the coin values to 3.00, which some high rolling players may wish to do! The only bonus feature that you can trigger when playing the King Colossus slot game is the free spins bonus game of which you will find a description below. One thing that does however make this slot even more appealing is that it has been set to return to players over the long term a very high payout percentage set at 96.57%! Take a look at the following section for an overview of just how that bonus game is triggered and how it will play off, for when it does trigger you are going to have the chance of winning much more than you can do via the base game! The large sized Scatter Bonus symbols are what will trigger a set of free spins when you are playing the King Colossus slot game, and when you get them appearing on each of the three reels they are attached to the bonus free spins feature game is yours to play off. Those symbols by the way are only found on the first three reels, so do not expect them spinning in on reels four and five as those reels have no bonus symbols on them! Two things will come into play during the bonus game, the first is that additional bonus symbols are added to the reels and those are the +1 free spin symbols, each time one or more of those symbols spin in one additional free spin is added to your total for each one that does appear in view on the screen. Also the King symbols become huge sized symbols during the bonus free spins round, and as such as they cover 9 reel positions on the middle three reels you will have a much greater chance of forming multiple 4 or 5 of a kind King symbol related winning combinations when that symbol does spin in! 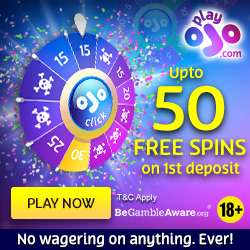 During the base game the Wild symbols stand in for every other reel symbol with the except of the +1 free spin symbols and the bonus scatter symbols, as set of winning payouts as listed below are also awarded to you when three or more of them line up from left to right on the screen on any payline. 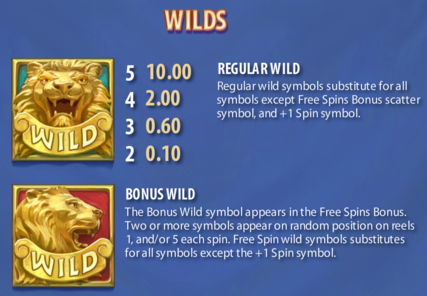 There is however a special set of Bonus Wild symbols that will come into play however those additional symbols will only ever make an appearance on the reels during the free spins bonus game as mentioned in the section above! 5 Wild symbols in a line pay 500 coins. 4 Wild symbols in a line pay 100 coins. 3 Wild symbols in a line pay 30 coins. 100 coins are paid when 5 King symbols line up. 30 coins are paid when 4 King symbols line up. 20 coins are paid when 3 King symbols line up. 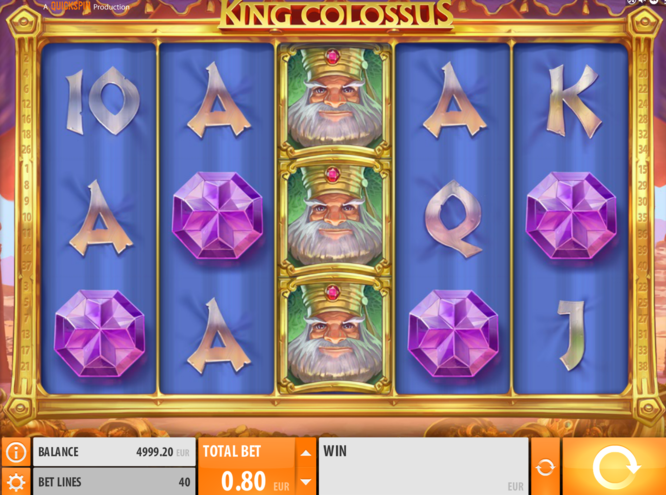 The King Colossus slot is one of the more playable slot games from QuickSpin thanks to the way the base game feature and the set of free spins play off. What you will find when playing it as soon as you do trigger the free spins bonus feature you will be willing those huge sized King symbols to spin in! Plus, being designed as it is there will be plenty of ways to win when the free spins have been awarded to you thanks to the 40 paylines you are forced to have in play one each spin!